If you catch a little sniffle/cold/bug that leads to a cough – what do you turn to? Probiotic Powder (a good brand, in water, not the pill casing) – as an extra boost. Don’t underestimate the power of good probiotics. Why a powder and not a pill? Because a powder dissolved in water goes straight into the bloodstream, where the contents of a pill don’t reach the bloodstream until it’s first been broken down in the stomach. Stomach acid, when it breaks down the pill casing, will also destroy part of the contents of the pill, thus making a powder added directly to water more effective. Cut down on sugar consumption (it lowers immunity) and eat organic rainbow veg, leafy greens, good quality protein etc. Steer clear of dairy. It can cause congestion. 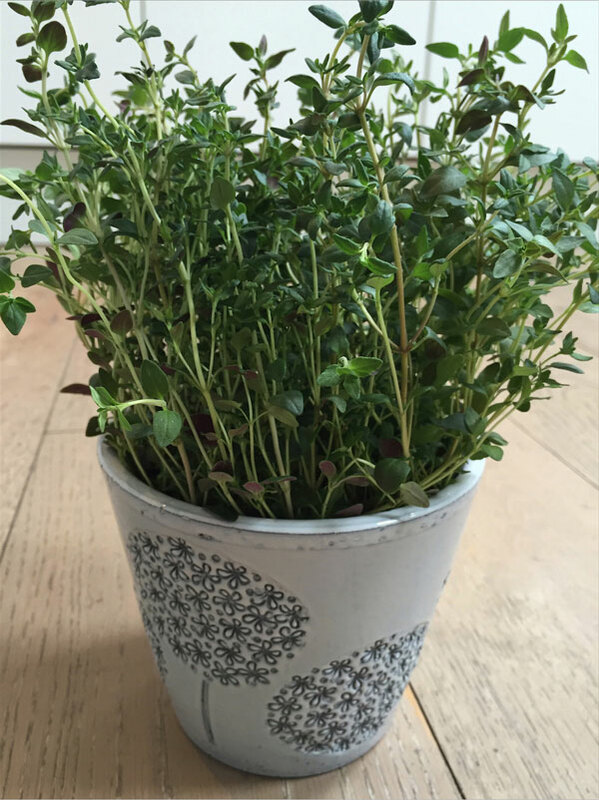 Snip a few stems of fresh thyme, pop them in a pint mug and top it up with boiling water. Allow it to cool, drink and keep up this simple routine until the cough subsides. It doesn’t take too long and is so much more effective than pushing medicine into the body. Drink plenty of water – you can do this in the form of a cup of thyme tea for double the benefit. It’s actually delicious too! A raw, locally sourced honey will give you the best of the bees goodness, act as an antiseptic and also coat your throat with a thick honey, which will soothe the discomfort. Often a good thing to do to help you to get to sleep, when throats seem to dry out the most. I often drink peppermint tea and haven’t found it to be a cure for coughs, but it’s known to be a decongestant and can soothe the throat as well. Some people also use peppermint oil in hot water in a bowl and use it as a facial steam, to relieve symptoms. All these ingredients are readily available in local shops/supermarkets, so you’re never far from nature’s own cures. I hope these little tips help you. See you Sunday for Photography Corner!